So, what is all the Buzzz about Bolognese -- AND WHAT IS A BOLOGNESE? A Bolognese is a small white fluffy pure bred dog. Their weight is 5 - 10 pounds. They are hypoallergenic and non-shedding. Because Bolognese are not yappers, they make an excellent choice for condo and apartment living. Bolognese are affectionate and very adaptable. They resemble a stuffed animal. Bolognese are very healthy dogs with a long lifespan 14-17 years. I breed for HEALTH, TEMPERAMENT, AND BEAUTY. I am very selective in choosing my breeding stock. Bolognese are sturdy little dogs. They are Champions in Agility. There are champions throughout the Snow White Bolognese lines. We have World Junior Champions, and European and World champions. Among these is a Bolognese named Julieta. She won Best of the Breed at the European dog show in Celje, Slovenia. The Bolognese was named after Bologna, an ancient city in northern Italy, that was thought to be the place of their conception. The existence of the Bolognese has been recorded since the year 1200. The Bolognese is an ancient breed of noble origins. It has its roots wit Italian Aristocracy. Bolognese were considered very valuable and were known to be the "Pampered pet of Royalty and Aristocracy." They were the coveted companions of European Nobility. This Famed Breed continued to be sought after well into the 19th century. At one time the Bolognese was almost extinct. There are currently less than 1,500 Bolognese in the United States today. In 1986 the Bolognese was first imported to America. 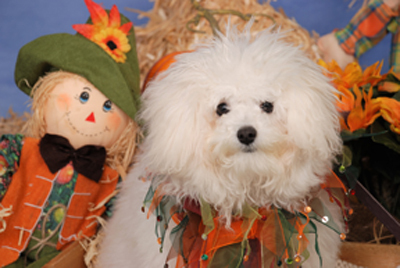 This small white dog is quickly growing in popularity today, and is considered to be a RARE COMMODITY. The Bolognese is truly the "ULTIMATE" companion dog, and were bred solely for that purpose. They want nothing more than to PLEASE you. With the Bolognese it is all about you! The even tempered Bolognese has incredible endearing qualities. They are devoted to their owners and have a very strong Bond with them. They are highly intelligent, and extremely easy to train. 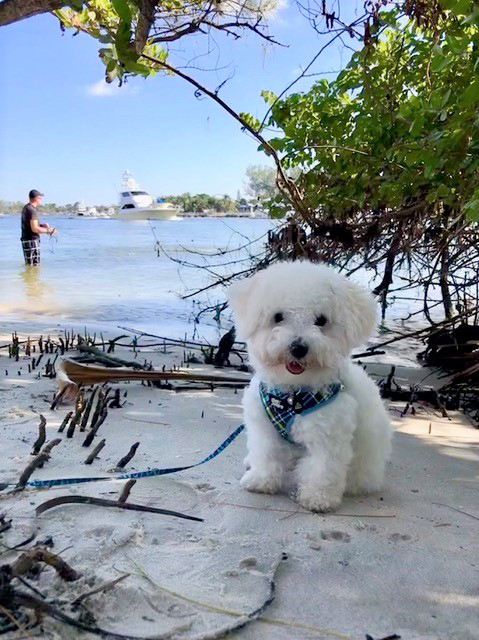 This unique little white fluffy dog has often been referred to as an "Anti-Depressant Dog." They are extremely entertaining and make people laugh. They are very playful and bring so much JOY into your life. Many of my customers have said they "cannot wait to get up in the morning to spend time with their Bolognese." Bolognese are delightful and make excellent Therapy dogs. You may often find them in Nursing Homes and on certain units in a hospital setting. Their presence there brings comfort to the patients, thus combating depression. They bring comfort, pleasure, and laughter to those people who need it the most. You can observe many smiles on the faces of the elderly when the Bolognese comes to visit. BREEDING FROM CHAMPIONS WITH "EXCELLENT PEDIGREES"
I am a small home based Bolognese Dog Breeder. I am ONLY a Bolognese Dog Breeder. I have a tremendous amount of love and adoration for this Rare Breed Beautiful Bolognese. 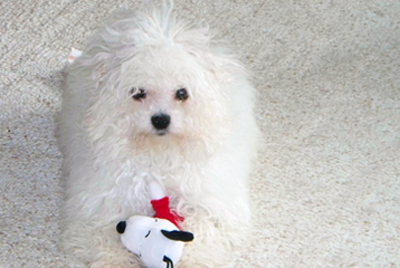 The Bolognese is a small, fluffy, white Toy Breed between 5-10 pounds. It is non-shedding and hypoallergenic. The unique Bolognese is very intelligent and highly trainable. Bolognese are well behaved and are quiet . Bolognese bond well with other animals and people. They are happy, healthy, and eager to please you. They quickly become a highly valued member of your family. They are very entertaining and have their own "special dance." ​ They will often stand on their hind legs while waving their front paws in the air. Bolognese Breeders refer to this as the "Bolo Dance." They are truly a Treasured Breed. I am devoted to my darling dogs and they are an integral part of my family, home and life. Snow White Bolognese has BOLOGNESE PUPPIES FOR SALE throughout the year. They are from champion bloodlines with excellent pedigrees in Portage, Michigan. Call Snow White Bolognese today to reserve your new puppy! !